Curt Bedrick, top, and David Sturdevant of Comstock Construction work in the mud room of a first grade class as construction progresses on Immcaulate Conception Elementary School in Traverse City. The 72,000 square-foot building is replacing the former school, which was demolished over 2017 and 2018. Fifth grade classes are being held at St. Elizabeth Ann Seton Middle School, while third and fourth grade classes are being held in the Holy Angels Elementary and St. Francis High School building until construction is completed. Grand Traverse Area Catholic Schools Director of School Operations Eric Mulvany said the decision on when to start moving students into the completed building will be made early next year when a clearer idea of the project's completion is understood. "Once we can see the light, it's go time," said Mulvany. The location of the two demolished buildings will be a parking lot and playground next to the school and church. "For the first time since, forever, people will be able to see the church from Division Street," said Mulvany. 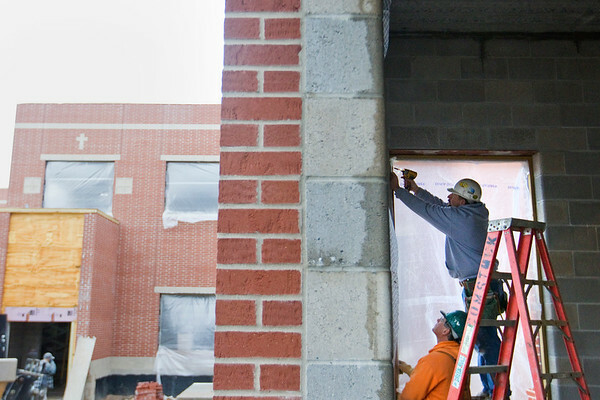 Once the Immaculate Conception project is complete, the school will house about 550 students from pre-school to fifth grade, as Holy Angels Elementary School students move across town to the new building and St. Francis expands to take over the entire building it currently shares with Holy Angels. Planning and fundraising will also then begin on renovations to the St. Francis High School building.